Perhaps it all began Christmas 1972 when Santa left a yellow Easy Bake oven under the tree for two little girls. Identical twin sisters, Jennifer and Joanna, were the ecstatic recipients of that oven. They played and baked, waiting patiently for something to “cook” with a 40 watt light bulb – oddly enough, all of their wondrous creations tasted the same. The mixes were terrible, however, the idea that you could eat “a whole cake” by yourself was genius. And the fact that you could create a sort of assembly line–pushing one cake in forced the done cake to the cooling station. It was magical! We no longer have that oven, however, our joy for baking has continued. Jennifer is a graduate of Bonnie Gordon’s Confectionary Arts Diploma program and is a passionate baker. She enjoys creating custom cakes in addition to decorating hand-crafted cookies and cupcakes, that look beautiful and taste even better. Joanna is the creative consultant, offering design input and a focus on administrative tasks. 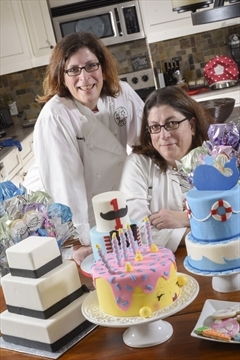 Together, “The Baking Twins” deliver creativity, beauty and style, by providing individually designed confections for all occasions, big and small. Feel free to view our growing gallery, contact us so we can work with you for your next event, and check out our social media links and blog!